In the very early 1990s I once booked a boat dive out of Kiama on the near South Coast of New South Wales. However, this dive (using a boat called PT-73) had to be cancelled due to very bad weather. 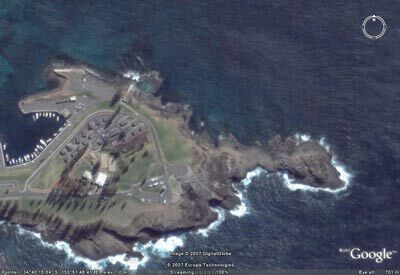 Since then I have often thought about diving the Kiama area but until mid-2001 I never got around to it. In May 2001 I took at day off work and travelled to Bass Point with my girlfriend with the idea of diving The Arch or Bushrangers Bay. However, upon arrival, we found the area closed as the road was being graded! After a bit of thought, we decided to drive a bit further south to Kiama to see if we could find a spot to dive. The dive shop was closed but my girlfriend told me that the person who owned the pet shop next door was also a diver. He told us about the best places to dive and gave us excellent directions to the sites. It is only about 60 to 75 minutes from the southern side of Sydney to Kiama. Famous for the Kiama Blow Hole (who as a school kid did not travel there for an excursion? ), it is also a very pretty place. On the northern side of the Blow Hole there is an excellent section of reef where the locals do a lot of shore diving. After driving from Sydney, take the road into Kiama from the Princes Highway and go down the main street, following the signs to the Blow Hole. Once at the Blow Hole, park in the northern-most carpark. Take a walk and look at the rocks below you. In small southerly seas and when calm, this area is quite protected and there are some very good entry spots and a couple of excellent exit locations. You can also exit to the west past the small ocean pool (take a walk to check this out if needed). You can enter the water in a lot of locations but most of them are quite a walk over a difficult rock platform. The best that I could see (saving my energy as much as I could) was in a gutter almost straight below the carpark, behind the large rock. This gutter also has the best exit, a wide ramp that enables a very safe exit. I called this dive site Afghan Reef, although I am not sure if this is the local name. There is certainly a spot called Afghan Gutter, named (perhaps cruelly) after the people who were washed off the rock platform here a few years back. After gearing up, walk down the rough track and then across the flattish rock towards the large boulder. Go to the right and zig-zag down to the gutter. You can enter the water anywhere here and swim out 10 or 20 metres before submerging. The depth here is four to five metres. There is a huge a mount of fishlife in this area but keep this till the end of the dive for more exploring. Swim out of the gutter (it goes north-west) before turning north (or a bit east of north). The depth stays around six metres for a few minutes before it gradually drops to about nine metres before rising again to eight metres. Time will be about seven minutes. The reef is mostly cleared igneous rock (similar to Bass Point and Batemans Bay) with some kelp. The reef again drops, very gradually, to just over 18 metres. It will take you 12 to 15 minutes to get here. Along the way there are lots of one-spot pullers, black reef and moasic leatherjackets as well as many other species. Once you hit the sand (note there are some smaller sand bits higher up in the reef), follow the edge to the south-east. The depth will slowly come up to 15 metres or so. Along the sand you will see sea dragons. Once you get to the 15 metre area, there will be a fairly obvious wall on your right that is at about 12 to 13 metres. Travel a bit further past the wall and then back track. It will be about 20 minutes. Go up over the wall and head to the south-west. This direction will bring you back towards the start. As you go, the depth rises to eight metres and then six metres. You will now be back near the gutter's entrance and it will be 33 to 35 minutes fromthe start of the dive. Keep going past the entrance and follow the rock platform wall to the west and north-west. The depth is about five to six metres all the way. This whole area has excellent fishlife, with huge schools of luderick, a lot of blackfish and bream, a few small snapper and even kingfish. There are huge schools of yellowtail and seapike as well as bulleyes. Fantastic! Be careful in this area as there are a lot of rock fishers in this area (some quite cranky) and there are lines and hooks everywhere. You can either continue for a while and return to the gutter where you entered the water or keep going to the pool and exit there. If you decide to exit at the gutter, explore a bit on the way back, but beware that there are other gutters that you may accidently enter before you find the right one. Surface and check that you are in the correct gutter and simply swim on the surface and up the ramp and then crawl till you are clear of the water. This is a very good shore dive, not too hard. You need calm seas (perhaps okay in small southerly seas). The main thing is to check it out first and if in doubt, start from Kiama Harbour.